Art experts are wont to respond, “What you love,” thereby triggering a period of reflection that can encompass such criteria as artistic merit, ingenuity of design, historical significance and cultural relevance. Collectors tend to pair passion with knowledge to acquire paintings and sculptures, and the same rigor should attend the evaluation and purchase of furniture that represents the genius of mid-20th-century design. A segment of that rich category was heralded earlier this year by Barnebys.com, an online service allowing users to compare and buy items from dealers and auction houses around the globe. The company published a report highlighting the princely sums achieved for so-called vintage furniture, or — broadly — furniture that is less than a century old. “Strong interest and increased online access have led to massive growth in the furniture design market since the 2008 financial crisis,” according to Barnebys, which tracked sales and trends from 2009 to 2016 tied to 15 designers in five markets. The U.S. market during the period showed the accumulative value for American designers Harry Bertoia, Vladimir Kagan and Isamu Noguchi in the tens of millions of dollars, according to Barnebys. 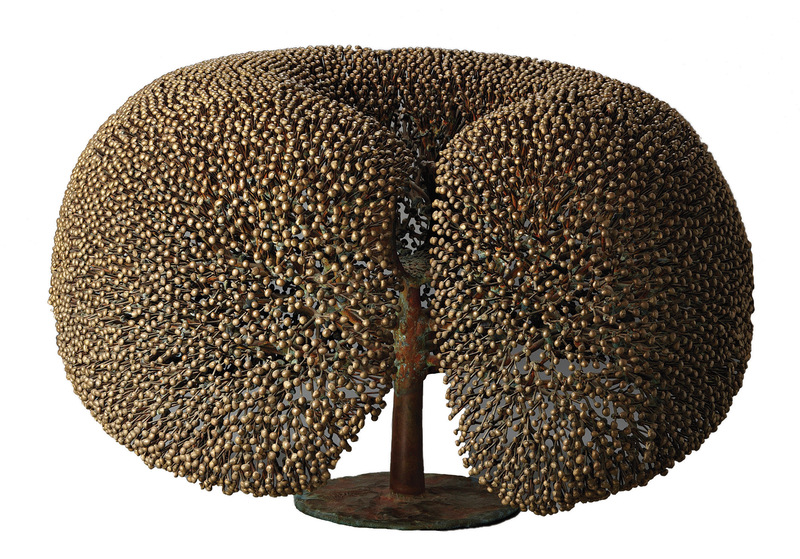 While it may require an act of willpower to resist the beguiling sculptural chairs by Bertoia, the symphony of sofas by Kagan or the architectural brilliance of Noguchi’s couches and tables, auction officials and gallerists recommend — as ever — that collectors gain information about items of interest and proceed accordingly. “Buy [furniture] you like, wish to live with and will be sure to enjoy,” says Walker. That sentiment is echoed by Jodi Pollack, co-worldwide head of 20th-century design at Sotheby’s. “I always advise collectors to buy what they love and what they find beautiful in their own surroundings. Once they identify that, it’s all about acquiring the best quality one can afford within their budget,” Pollack says. Sotheby’s would know: A screen by Bertoia — who, like Noguchi, was a celebrated sculptor — brought $790,000 at a 2015 Sotheby’s sale in a figure that shattered world auction records for the artist. Widely known for sculptures that emitted sound, Bertoia also gained acclaim for designing a line of chairs whose form relied on openwork and steel grids; chairs that are still produced by the same furniture company today. Pollack says the Bertoia market received a “shot in the arm” amid Sotheby’s high-profile sale last year of the Kaare Berntsen Collection, which showcased Bertoia’s sculpture and attracted a new audience of postwar art buyers. Sotheby’s paired the collection with its contemporary art sale in a strategy that fixed attention on the artist’s oeuvre, says Pollack. The most sought after pieces by Bertoia, Kagan and Noguchi are all originals, which are hard to come by and which will likely bring hefty amounts compared with their mass-produced designs, says Meaghan Roddy, senior specialist in design for Phillips, the global auction house headquartered in New York City. When an original is in the offing — say, for example, the Cloud Sofa or Chess Table that represent early productions by Noguchi — “they’re really jewels,” Roddy says. Inherent in Noguchi’s furniture is the modernist sensibility that the Los Angeles County Museum of Art says characterized design in California — Noguchi’s home state — from 1930 to 1965. 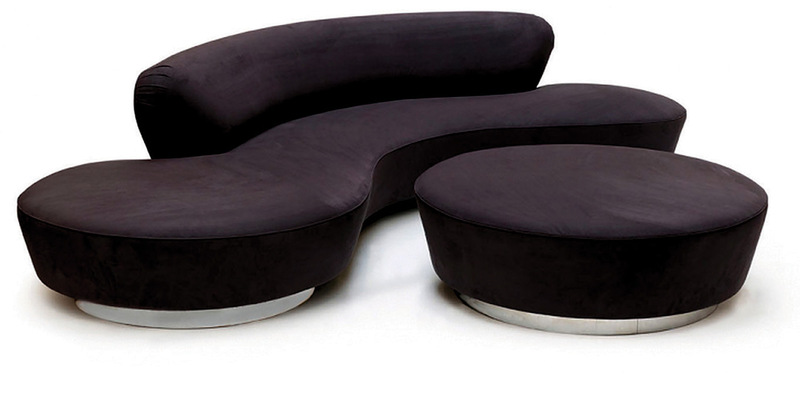 Kagan was inducted into the Interior Design Hall of Fame in 2009 after decades of success and critical approbation. The most popular of his furniture designs center on serpentine and free-form couches, but a record price was realized for a 1960s modular sofa, which went for $43,750 at a 2015 Phillips auction, according to Barnebys. Kagan was a prodigy who, in his 20s, had already secured such clients as Marilyn Monroe and was poised to become one of the most influential furniture designers of the last century, says Peter Loughrey, director of Los Angeles Modern Auctions. Loughrey also notes that the sleek furniture conceived during the early-to-middle decades of the 20th century grew in appeal for collectors roughly 20 years ago amid an understanding of art that is at once beautiful and functional. Rules of thumb for buyers, according to Todd Merrill, whose eponymous gallery in New York specializes in modernist and postmodernist American studio artists, is to know what they are purchasing and be sure it is not misattributed or otherwise misrepresented. To protect the investment value of a piece, Merrill advises collectors to sufficiently document an item’s authenticity, ensuring that it’s not massively or inexpertly restored and that its finish is original. “If it is ‘in the style of,’ re-lacquered or refinished, you will be very disappointed when you go to resell it,” Merrill says. A measure of furniture’s value is its utility, yet that very quality can lead to certain degrees of wear-and-tear that tend to lower the item’s resale value. No one is suggesting that collectible furniture be placed on a pedestal or enclosed in a bubble, but there are a few simple steps collectors can take to prevent and repair damage. – Tad Fallon, co-owner and furniture conservator with Fallon & Wilkinson, recommends minimizing uneven light exposure to prevent fading. – Fallon also suggests protecting furniture from adverse housekeeping products or practices. That includes avoiding inappropriate cleaning solutions or techniques. For example, metals used in Bertoia designs are typically coated, and it would be advisable not to damage or destroy such finishes with abrasive solutions or harsh scrubbing. – Restoration should be undertaken by an expert with a full understanding of materials, finishes and modes of construction. That is, seek a trained conservator instead of taking the piece to any shop promising furniture repair. – Some wear will attend upholstered items and facelifts in those cases should seek similar fabrics and sewing or other techniques that are executed in the same craft tradition, Fallon says. – Reupholstering a piece as distinctive and sizable as one of Kagan’s signature sofas is closely linked to both the degree of disrepair and the value the owner attaches to the item, says Fallon. It’s crucial in any restoration to follow the form and underlayment work, such as with Kagan’s Serpentine sofas, or to adhere to “those beautiful, subtle curves,” Fallon says. – Fallon advises consultation with conservators who either already know the genre or are willing to carefully research it.